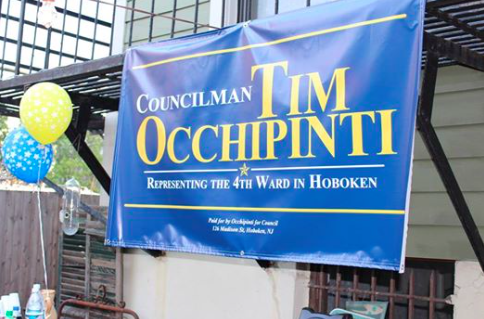 As MSV mentioned in its rumor column "Grist for the Mill," the occupant of the fourth ward council seat, Timmy Occhipinti had a soft launch for re-election last week. The "event" took place last Thursday. Although Frank "Pupie" Raia is sticking with his horse, word is the buzz was not there. Over the weekend Sully wrote in his weekend column another Old Guard candidate was looking to get in the mix. That reference may in fact be true although an actual filing is not clear to this point. I love living in the 4th Ward and even though I'm not sure where the buzz about me running originated, I'm truly honored to be mentioned. I probably sound like an award show nominee by saying that, but I'm of the opinion that public service is something to be celebrated, and it would be an honor. It's not something I have given much thought to. The 4th is the best section of Hoboken and has produced some great leaders over the years but too many have tried to use it as a stepping stone to something "bigger and better". Whomever wants to sit in that seat needs to understand that the people of the 4th Ward are first and ambitions should be a distant second. Multiple sources say Jamie Cryan is not taking the challenge to his role as Chair of the Hoboken Democratic Party laying down and Beth Mason's attempt to buy it via purchase of council members Michael Russo and Terry Castellano is most unwelcome. Is the Russo clan going to pull off another sale of Hoboken? Tune in tomorrow as MSV uncoils more truth on the error ridden Hudson Reporter on this question.